Enough dreaming… | House by the water. In this blog, I’m going to shock you with money talk. I’m going to tell you what building costs. It will save my Dad asking. For a new, two story home, large enough to comfortably accommodate a family of five, and with the potential to gaze at the canals from rear living areas, we are talking in the order of $600K. Oooh… A very nice single story house could be built for closer to $400K. Probably we are only going to do this once, and if we are going to spend any money at all, we want to spend it on something we like. For now, let’s start with an “off-the-plan” house with a $600K price tag. We’ve read that an extra 10-20% should be anticipated for the extras such as heating/cooling, flooring, sometimes painting and minor changes to the plan. Silly me thought this would also include the stuff that needs to be done to the block before a house can be built on it. Nope, it turns out that is another 20% all of its own. After Igor’s recent meeting with a building company rep, the first thing he had to say to me, predictably, was “You need to get a job”. Yup, that’s any extra $121000 before you even think about an extra garage space, a different roof line or an extra window. Time for a browse through the job classifieds. 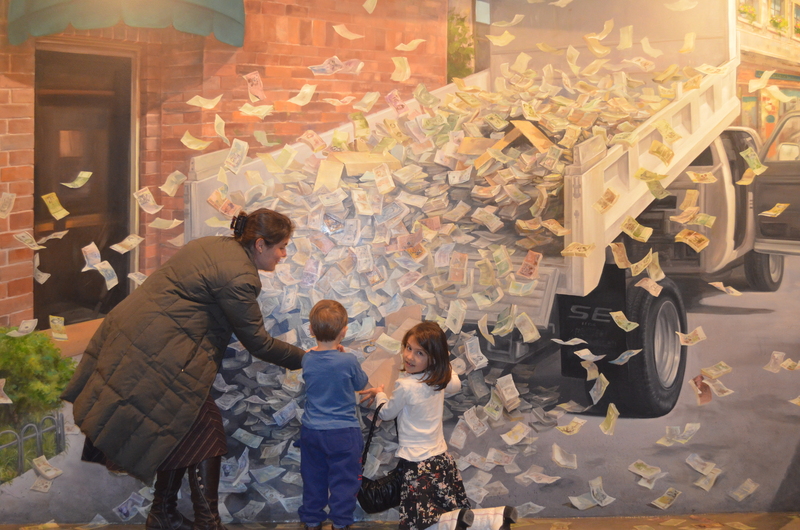 Luckily, the very next day, on my way home from the Trickeye museum, I happened to come across a truck load of cash. Does that include a jetty? Does that include a jetty with pretty lighting? Thanks for reminding me. No. Oh dear oh dear (dear as in expensive!) I’m guessing the figures for extras are approx and on the lower side too. I think the truck load of cash is the way to go…love the graphic! and Dad says: Get another quote! So far our quote for lights alone has come back at $7000 – I am yet to see the light installation cost and the cost for any extra power points (over and above one power point included for each room). This also does not include a few special pendants that I will source myself. We are having a big house though and due to being overseas are a bit limited with our “shopping around”. I wonder what other people’s lighting costs….